In this cartridge comparison, we are going to take a look at two cartridges, the .338 Lapua and the .50 BMG, two rounds that separate the men from the boys. Seriously, these are heavy duty rounds that fill a very specific niche in the shooting world. These include heavy stopping power that can be carried over incredible ranges. While there are parties who will place one cartridge over the other, we are not looking to do that in our comparisons. Instead, we want to take an unbiased look at the data in several ballistic and other performance category and compare them. While these two cartridges might overlap in some shooting applications, we think there are niches where they stand apart as well. By doing this, perhaps we can tease apart in which situations one cartridge might be better suited over the other. We will take a brief look at the origins and histories of these two cartridges and then jump into categories such as stopping power, trajectory, and even price among others. So , let’s get down to business. The .338 Lapua Magnum has a much shorter history than the other cartridge we will be examining in this article. The 338 LM was designed and produced in the late 1980’s. The purpose of this cartridge was to was to provide snipers with a long range round that had incredible terminal ballistics and could penetrate several layers of body armor at extreme distances. This is a hard hitting round with incredible range and power. It saw service with the military in both Afghanistan and Iraq and is still in use with military personnel today, but it has also found a loyal following among civilians. The range and terminal ballistics of the .338 LM were such that its use could fill several niches in civilian use including long range precision shooting and big game hunting. The increased interest in the .338 LM in civilian circuits has resulted in more round options though still limited compared to other competition and hunting rounds. The .50 Browning Machine Gun (.50 BMG) was developed for the Browning .50 caliber machine gun in the late 1910s as countries began producing armored vehicles leading up to WWI. The cartridge itself has been made in many variants from armor piercing to tracer rounds, though most factory loads that can be accessed by civilians are the typical bullets. Besides military and police organizations, the .50 BMG has gained popularity in some civilian circles. The majority of its use in these circles is through extreme distance shooting though there are small circles that utilize it for hunting purposes, mostly for large or dangerous game at extreme distances. These are extremely large rounds that require heavy weapons as well as other equipment to shoot accurately. Factory loads for civilian purchase are limited with most of the available rounds coming with bullet weights between 650 and 750gr. Before we get into the meat of the article with our comparisons, we want to briefly touch on how these two cartridges look up next to each other. It should already be clear that the difference just from the bullet diameter is quite dramatic. To be able to push such large bullets to speeds that make them useful is going to take a good deal of powder and both have the casings to hold it. In all aspects of the case proportions, the .50 BMG is much larger than the .338, which is a big round when compared to other popular hunting /shooting rounds. This shows most dramatically in the case capacity where the .50 BMG can hold nearly 200 more grains of powder than the 338LM. With such differences in cartridge specs, we can assume that the ballistic performances are going to be quite different as well. In some cases you might be surprised. To do this, we have selected several rounds for each cartridge we are comparing. These are factory loads that are available for purchase. This is by no means a comprehensive list, but it does include some of the more popular rounds for each cartridge. These rounds are listed below. Before we get into our comparisons, there is one more note that we would like to make. We are using computer data that was compiled from the manufacturer’s websites as well as from trusted ballistic calculators. Where there are variables, we try to keep them as uniform as possible, but for some cases, it only makes sense to change these variables based on the cartridges. When this is the case, we will be sure to make it clear what we are doing. Because this is computer generated data and because each rifle has its own personality, the actual numbers that are going to come from firing one of these rounds from your rifle, the numbers shouldn’t be too far off but we wanted to make it clear that these numbers are not set in stone. Even so, computer generated data is a proven and safe means for comparing two cartridges as we will do here. For a lot of cartridge comparisons we have done, recoil is usually not that huge of an issue. With modern firearms, the majority of centerfire rifle cartridges can be tolerated with regards to the recoil. With the .338 Lapua Magnum vs .50 BMG, recoil takes on a bit more of an important role. Both of these cartridges are going to produce a tremendous amount of recoil. Huge bullets with enough powder to send them downrange at supersonic speeds are going to produce enough kick to knock you down. To use either of these rounds, muzzle brakes and other support is needed to use rifles chambered for these cartridges. Now, in this section, we are not looking technically at the actual felt recoil but instead at the recoil energy(ft.lb) that is generated when firing these rounds. As we mentioned above, firing these rounds often requires heavy firearms and other pieces of gear that help negate this recoil. Still, by comparing the recoil energies, it will translate loosely into what you feel. Maybe even more so when looking at these two rounds. Let’s first take a look at the recoil energy (ft.lb) of these two rounds in general. This data was taken from the standards used by the ballistic calculator for the .338 LM and the .50 BMG rounds. As you notice, the .50 BMG has nearly double the recoil energy than the .338 LM. We will see more drastic differences between our selected rounds, and we cannot comment on the exact variables used for this result. We do know that the recoil energy is nearly double even with the 50BMG using a 30lb firearm compared to the 15lb for the 338. This graph should give you a good idea about the major differences we are looking at here. 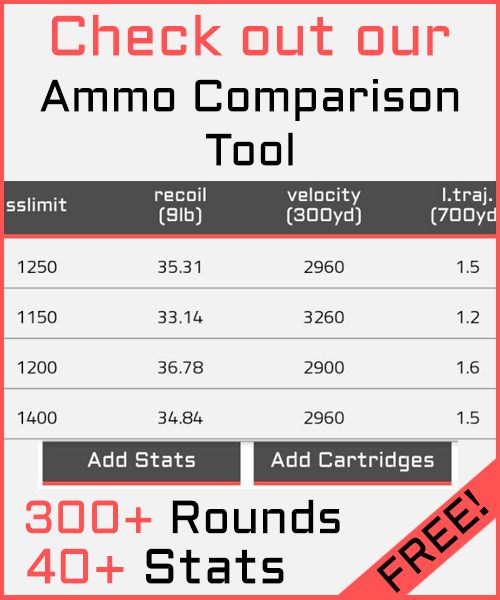 Let’s take it a step further and take a look at the rounds we have selected for comparison. We arrived at these numbers by using a 15lb firearm for the 338 LM rounds and a 30lb firearm for the 50 BMG rounds, which are common weights for rifles chambered for each cartridge. As for powder charges, we used conservative numbers for each round based on the hand loading specifications from Nosler. We went conservative with the powder weight because these are factory loads and are not normally loaded near max capacities. Again, these numbers can vary based on the variables, but with our consistency, we think the comparisons are more than valid. 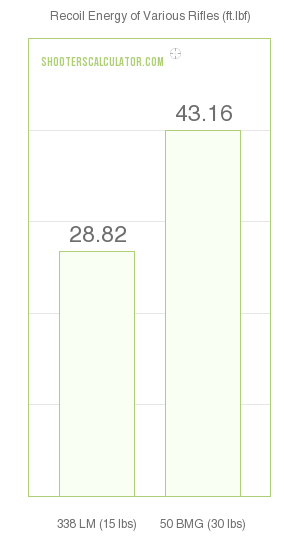 When we look at the graph, it is quite a stark contrast between cartridges. The 338LM rounds under our specifications have recoil energies ranging between 29 and 33ft.lb. The 50 BMG rounds range from 72 to 87ft.lb of recoil energy. This is near impossible to handle accurately unless accessory gear is used to help absorb and stabilize the rifle. And if you need the performance of the 50BMG, you are probably already aware of what you are in for and with today’s modern gear, you are perfectly capable of using this cartridge efficiently. Just for comparison of how intense the recoil energy is for these two cartridges, some common hunting rounds such as the .30-06 and .308 are generating recoil in the 20-26ft.lb range when using a 7lb rifle with the same conservative powder loads. And like we said, if you need a large cartridge like both of these are, you probably already knew you were going to be dealing with recoil. What you might be looking for is how these rounds behave in flight, which is what we will look at next. You might be strictly a hunter or strictly a competition shooter, but the majority of us are a mixture of both. Regardless of what you’re using your rifle for and regardless of the cartridge it’s chambered for we are all going to be interested in its ballistic performance. This includes the velocity, the BC, and the trajectory of the round. By understanding these different parameters, we can not only better adjust to specific shooting conditions and be aware of our limitations, but we can also begin to tease apart certain situations each of these cartridges might be better suited. We also want to note that while we are taking each category and looking at them independently, all of these categories are interwoven with each other, including recoil and stopping power that we will look at shortly. We will bring this up several times throughout our discussion but keep in the back of your mind that your ultimate choice should consider all of these results together rather than focusing on one independent category. The velocity of a bullet is key for both hunting and range shooting purposes. Velocity is key for proper penetration and expansion, which is critical for hunting. Higher velocities, with a stable bullet, also aid in long range performance, which is critical for both hunting and competition shooting. In context of the 338 Lapua vs 50 BMG where both are popular long distance rounds and to a smaller extent hunting rounds, velocity is a key component to our comparison. Let’s take a look at the velocities of each round from the muzzle out to 1,000 yards. Just from first glance, we see that the various rounds of each cartridge are pretty varied and a general trend for one cartridge over the other doesn’t jump out right away. If we take a closer look at the averages of the round, we see that the 50BMG rounds carry from 200fps (Muzzle-700yds) to 300fps (800-1,000yds) more than the 338LM rounds, which is quite remarkable given how much heavier the 50BMG rounds. Though they also carry quite a significant amount more powder and as we saw previously, you pay for it with the recoil. Of course, looking at averages might not be fair as there are .338 LM rounds that carry similar or even higher velocities than some 50BMG rounds. And this is case when comparing most cartridges. We also see that all rounds for both cartridges leave the muzzle at more than 2,500fps and maintain supersonic speeds out to the 1,000-yard mark. These are excellent speeds for long range shooting, especially when shot from a rifle with the proper twist rate to stabilize them in flight. As we mentioned earlier, the velocity has a lot of influence on other aspects of the bullet’s behavior such as expansion. For hunting, a lot of hunters want expansion to cause a larger wound and more damage. You might be asking yourself if the velocities shown here are enough for proper expansion of such a large bullet such as the .50cal. Most people who are using a .50 BMG are not hunting and are looking at extreme distance shooting. Most .50 BMG rounds are not designed for much expansion. And besides, we’re talking a .5” diameter wound size; you don’t need a whole lot of expansion anyway if you want any meat left over. If you’re looking to choose between heavy, hard hitting, and far flying cartridges such as the .338 LM and 50 BMG we are pretty confident that you are well aware of the ballistic coefficient. Still, some might be unfamiliar, so we want to touch on what exactly a ballistic coefficient is before we move on to the comparison. The physics and theories behind the ballistic coefficient can get quite cluttered and complicated, though we highly recommend diving into the subject when you have the time. For this article, we are going to explain the BC in the simplest of terms. The ballistic coefficient is derived from an equation that uses several bullet and cartridge variables. A few of these include the bullet design (spitzer, boat tail, flat nose, etc.) and the speed of the bullet. The ballistic coefficient gives you an idea of how streamlined a bullet is. The higher the ballistic coefficient, the better the bullet can resist wind drag and wind drift which would make the bullet less likely to be pulled off of its flight path and, in theory, be more accurate. How important the ballistic coefficient is with shooters often depends on the distance of shots they are taking. We have hunted a long time and talked to a lot of our fellow outdoorsman. You would be surprised how many of them have never given their rounds BC a thought. It’s because 90% of their shots are coming at 250 yards or less. On the other hand, talk to F-class competitive shooters, and the trend is the opposite. Shots traveling 1,000 yards are much more prone to these environmental factors, and we would bet that 99% of them are very aware of the BC. For two cartridges that are touted as extreme distance shooters, the ballistic coefficient is going to be an important factor for potential users. 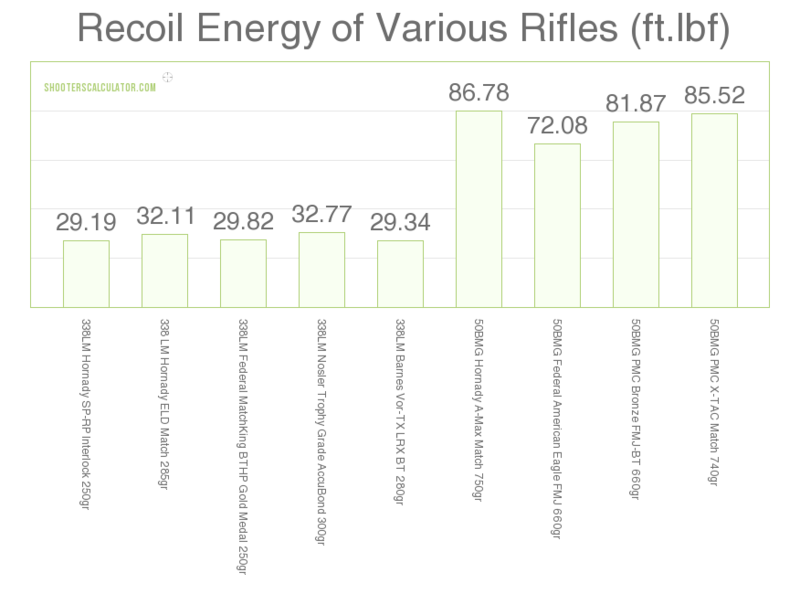 We have compiled the ballistic coefficients for all ten rounds and graphed them here. To begin, these selected rounds all have excellent BCs that most would be more than happy with. All of them but one .338 LM round break the .55 mark. The 50 BMG rounds are quite impressive with BCs all above the .7 mark and one round coming in with a 1.05BC. What we hope you draw from this is that both of these cartridges have a BC that corresponds with highly streamlined bullets. We also hope that we have made clear that the BC is not a point for comparing which bullet is better or worse than others. Heck, the BC of a bullet can change based on temperature, altitude, and pressure. Regardless, a round with a higher BC is going to maintain a higher BC than a second bullet since both would be effected in the same way. The BC of a round also plays a large role in the trajectory of a round, which we will look at next. The trajectory is what just about every hunter or competitive shooter of every skill level will be interested in when comparing two different cartridges. More importantly, we are interested in how flat a bullet flies over a given distance. The less a bullet drops during its flight, the easier it is to make adjustments for longer distance shots. Obviously, this would be an advantage for shooting round out at 1,000 yards or more. We think a flat trajectory also gives you a little more room for mistakes when it comes to judging distance quickly, as is sometimes the case when hunting. We are not going to sit and mess around with the short range trajectory. Both of these rounds are going to shoot flat at 300 yards, but the real reason is that if you are using these cartridges to take shots at that range, there is no helping you anyway. So, let’s focus on the long range trajectory for these two cartridges. As we have done in previous sections, we are going to look at our ten selected rounds. We are measuring the bullet drop (inches) from 100 out to 1,000 yards. The firearm has been zeroed in at 200 yards. Out to 400 yards, there is little to no difference between the two cartridges. There are two to three inches difference between the highest performing 50 BMG round and the highest 338 LM round. It is when we move out from this marker that we begin to see a general trend between the 338 LM vs 50 BMG. 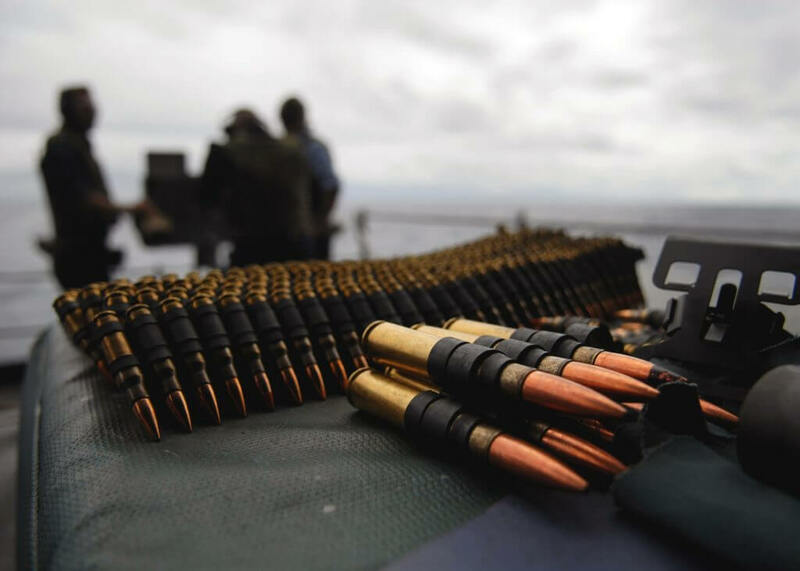 Like most cases, there are better performing rounds for each cartridge type, but on average, the 50 BMG rounds excel in this category, and that distinction becomes clearer the greater the distance. We will shortly look at the averages of these cartridges, but want to point out again that while some of the numbers might seem like drastic differences, and technically they are, it’s critical to observe the individual rounds, specifically the .338 LM. The difference between the two rounds is as followed with the 50BMG showing a flatter trajectory. As you can tell, there are some pretty dramatic differences. These results don’t necessarily mean that the 50BMG is a more accurate target, but it does point out that when taking on distances up to and past 1,000yds, making adjustments might be a bit easier with the flatter shooting 50BMG. For hunters, stopping power is a critical factor in choosing a certain cartridge. Coming up on wounded animals, especially if they are predators, can be dangerous and being able to drop them cleanly takes this risk away. Most hunters also want enough stopping power to be able to make a clean and humane kill of the animal with causing unneeded suffering and risk losing it in the field. About the previous point, a clean kill means you are not going to have to track a wounded animal sometimes a couple hundred yards and possibly in the dark and cold. We don’t have a single set of data we can look at to determine stopping power. It’s a culmination of several factors including bullet energy, penetration, bullet expansion, and shot placement. In this section, we will take a look at bullet energy and penetration for comparing the 50 BMG vs 338 Lapua Magnum. While it is only two factors that go into stopping power, they are the best for comparing two cartridges besides comparison in the field. And seeing the stopping power in action, we leave that to you. When a bullet is fired from the barrel, it carries kinetic energy that upon impact is transferred to the target. This large amount of force is very destructive to surrounding tissue and organs. As you can imagine, the bigger the game, the more energy you are going to need to cause enough damage for a clean kill. The energy is only part of the equation to stopping power, but it is an important one to examine nonetheless. How much energy is required to take down an animal varies and the amount that actually gets transferred to the target varies. But that’s the case with just about every round and is one of the many reasons that a lot of us have fallen in love with the sport. Still, we think that we can get some valuable information by examining the kinetic energy associated with our various rounds as the move from the muzzle down range to 1,000 yards. We’re not going to go too specific with the comparisons here. It couldn’t be more clear that the 50BMG carries exponentially more kinetic energy with it than the .338 LM rounds. The numbers with the 50BMG rounds are astounding, especially to some who might only be familiar with the more common hunting rounds. With ME of over 1,200ft.lb and and ME of over 5,000ft.lb at 1,000yds, there are no restrictions on the type of game you can hunt. With that being said, we wouldn’t recommend hunting the majority of game on planet Earth with a 50BMG; it seems pointless with the amount of damage it would cause to perfectly good meat. We’ll discuss this topic more in the applications section. The incredible energy of the 50BMG overshadows the .338 Lapua Magnum, which in its own right possesses a great deal of kinetic energy. From over 4,000ft.lb of energy out of the muzzle to between 1,000 and 2,000ft.lb at 1,000 yards, it too has incredible range when it comes to having the energy needed for most game animals in the world. Most of the cluster around the same amount of energy, but there is some variation. And like the 50BMG rounds, we will revisit this shortly. Another factor that goes into a cartridge’s stopping power is the penetration of the bullet. To be effective, a bullet must be able to penetrate through sometimes very thick hide and bone to reach vital organs. Of course, how much penetration you need is going to depend on the game you are hunting. A bull moose needs a bullet that can hold together and penetrate deeper than a bullet that is going to be used for whitetail. And this is simplifying the topic since we are leaving out expansion, which is also going to play a role in penetration. Think of it paired with the energy of the bullet. If the bullet passes through cleanly, remaining relatively intact, not all of the energy is transferred to the target. So there is a fine line a lot of hunters try to walk when it comes to penetration. For simply comparing two different cartridges, we are going to omit it for the sake of clarity. Still, by looking at the sectional density (SD) of the rounds, we can get an idea of how well these different bullets can penetrate and gives us a basis for comparison. We can estimate penetration based on the sectional density because of what the SD is derived from. The SD comes from the diameter of the bullet and the weight of the bullet. Heavier bullets with the same diameter are going to penetrate deeper than lighter rounds with the same diameter. If we have two bullets with the same weight, but different diameters, the smaller diameter localizes the force to a smaller area and gives you deeper penetration. If we look at the sectional densities of the ten rounds we see that there is not a huge advantage to one cartridge over the other in this regard though the 50BMG cartridge does have two rounds above the .4 mark. This comparison is interesting because of how similar the sectional densities are despite the major differences in bullets. While the .338 rounds have a much smaller diameter than the huge .50 cal rounds, the exponentially heavier bullet weights of the 50BMG rounds make up for the large size. Both are going to penetrate just about any hide or armor that is out there, it’s what they were designed to do, and we have seen from the velocities that they are going to speed and power behind them to get the job done. While this is important to understand, it’s equally important to remember that the SD, while a good means for comparing two cartridges, only tells part of the story when it comes to penetration. With two rounds that are extremely popular in long distance shooting, accuracy is, of course, going to be a category that generated a lot of interest. Even so, it’s difficult to compare the accuracy of two cartridges by the means that we have. Even if we had all of the rounds and a couple days to generate some MOA measurements it still might differ on another day in someone else’s hands. Still, with the categories we have examined so far, we can infer some information in a roundabout way when it comes to the potential accuracy between the 338 Lapua Mag versus 50 BMG. And we know we have harped on this several times throughout the article, but we are going to talk regarding cartridge versus cartridge rather than round to round. Both cartridges have the velocity needed for long range shooting though the 50BMG seems to show slightly higher velocities and this gap between the cartridges widens as the rounds move downrange. As far as the BCs go for these two cartridges, both show phenomenal numbers. The 50 BMG does have several rounds that break the .9 and even 1.0 mark, but the 338LM is nothing to scoff at either. Trajectory follows a similar trend where both show very flat trajectories, though the 50 BMG excels in this category as well. Recoil is also a component to accuracy though most will deny it has any effect on them. The fact is, both of these cartridges produce large amounts of recoil that can easily cause the shooter to flinch during a shot. Granted, if you’re firing these rounds, you most likely have gear that aids in absorbing the recoil and stabilizing the firearm. It’s really the only way either of these rounds can be fired accurately. Again, this conclusions and estimates are based solely on the factory loads we have been examining here and the data that accompany them. It’s tough for us in this situation because the 50 BMG is such as unique round and it makes it seem as if the .338 LM falls short in most categories and this is not the case. If you decide to make a go with the .338 or the 50 BMG, with some practice, you’re going to have an accurate cartridge. When dealing with more obscure cartridges that don’t have a huge market and takes quite a lot more material to make and you have the trifecta for expensive rounds. But, if you need the performance, it’s just something you have to deal with, especially if you don’t reload. The price for both is about equal per 20 rounds, though the 50BMG factory loads often come in boxes of ten rounds. There are some options for bulk purchase which can save you some money in the long run. As far as availability goes for the 50 BMG vs 338 Lapua Magnum, both are going to be harder to come by then smaller, more traditional hunting and target cartridges. With that, you have a better chance at running into .338 LM rounds than a box of 50 BMG. And even then, the options you have for 50BMG factory loads is extremely limited, even when compared to the .338 LM. Both of these cartridges have found a place in the long range shooting. A lot of competitions wouldn’t allow a .50 caliber round, but if you just enjoy taking shots upwards and beyond 1,000 yards, the 50 BMG is hard to beat. It has the velocity, the BC, and the trajectory to make shots of even 1,500 yards. The .338 LM is no slouch when it comes to long range shooting. Don’t let the comparison to the 50BMG throw off your judgment as to what this cartridge can do. This cartridge can easily take shots at 1,000+ yards just as the 50BMG, but there might be more dramatic adjustments needed to be made for these shots when compared to the 50 BMG. When it comes to hunting, there are great options for the .338 LM. With its trajectory and energy and bullet design options there are no limits to the type of hunting you can do with it. It is a bit much for medium size game at short ranges, but it would give you a huge advantage at long range if you believe that hunting ethical. 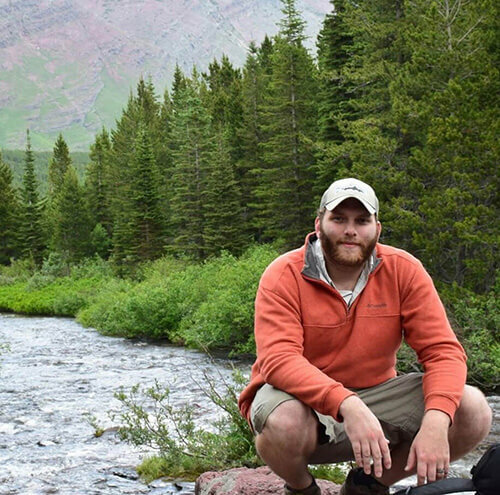 Rifles chambered for the .338 LM are a bit heavy to haul around the backcountry for most people, but it is much more manageable than a rifle chambered for a .50 BMG. There is a very small circle of people out there who have turned to the 50BMG for hunting purposes. The majority of these people are using the cartridge for long range hunting on large game such as elk, moose, and even dangerous game. There is no doubt that the cartridge has the power and the trajectory to take on this challenge, but there is always the ethical question of taking shots at animals from these ranges. We have no desire to act as a moral compass, you do what you want, but the arguments are out there, and we wanted to address it. The biggest issue we have with the 50 BMG is the sheer weight of the rifle. To handle these rounds in the field, you’re going to have to haul around a 30+lb rifle. We suppose it all depends on the type of hunting you do, but if you plan on doing any spot and stalk, you better be in shape. Before we wrap up the article, we wanted to pick a round from each cartridge that we really like for certain applications. For the .338 LM, we recommend the Nosler Trophy Grade AccuBond 300gr round. The round you choose for hunting should be based on the type of game, and this is perfect for the largest animals with the thickest hides. It possesses the ballistic performance to reach out to game at a distance and still carries the energy needed to aid in bringing down big game cleanly. The AccuBond bullet used is perfect for the proper expansion needed while not sacrificing penetration for large game animals. For the 50BMG, we are not going to give a specific round. They all can kill any game animal in the world. We are not huge advocates of its use in hunting, but if you have the desire to take it to the field, your biggest concern is how it flies, in which case check out the next section. For testing your limits on the range, we don’t think you can go wrong with the .338 LM Hornady ELD Match 285gr. It has velocities that compete with the 50 BMG rounds, one of the flattest trajectories when compared to other .338 LM factory loads, and a ballistic coefficient of nearly .8. It’s also not the most expensive .338 LM factory load that is available. It might not compete with some hand loaded cartridges, but you can’t get much better when it comes to a factory load. For the .50BMG, we would recommend the Hornady A-MAX Match 750gr round. It excels in all of the ballistic categories that we have covered in this article. While it is one of the more expensive rounds on our list, you are paying for incredible performance that comes close to matching hand loaded rounds from the experts. In our minds, there is no one cartridge that is above and beyond better than another. In certain aspects and certain situations, sure, there are cartridges better suited to the task than others. In the case of the 338 Lapua vs 50 BMG, we still feel the same. Both of these cartridges are capable of accuracy at extreme distances, and both have enormous stopping power. We hope that this article has highlighted these differences and provided you with a reliable source for making your own decision of which cartridge better fits your needs.